My girls love Japanese rice and meals. This is one reason why I have made some effort to learn to cook it at home. I have posted a recipe for Chirashi rice. I like these one-bowl meals as they are convenient to make. In this post, I will list out some details on how to make "Gyudon" or Japanese Rice Beef Bowl, using Short-rib Beef. What motivated me to cook this is the $60 bowl of rice with some beef which I had at a Japanese restaurant recently. I absolutely loved it but I found it too pricey. After making this, I really don't think I will pay for it again. Japonica rice is widely available in our local markets and you should be able to spot it easily as the grain is shorter compared to Thai long grain rice. They come in various qualities. If you are new to cooking it, I will advise you just pick up any for a start. As you begin to cook it more often, you can try some better varieties. Go here to learn how to cook this rice and what type to buy. It is important to wash the rice a few times till the water is no longer cloudy. Rub the grains with your palms as you do so. Soak the rice for about 30 minutes before you cook it in the electric cooker. I use a 1:1.1 rice:water ratio. If you like, you can add some sake. Unless you are making sushi rice, I prefer to leave the rice unflavoured i.e I do not put in any vinegar or salt/sugar. Japonica rice is more substantial (cf to Thai Jasmine) and so, normally a bowl (1/2 cup) will suffice per pax. Now, a few notes about beef. 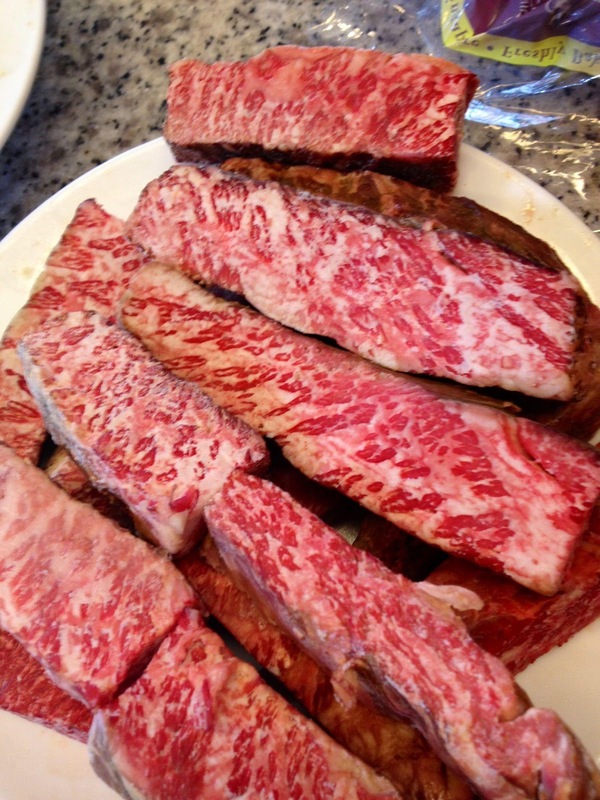 As a general guide, well-marbled meats like Wagyu are best eaten in thinner slices, grilled or Shabu-style (steamboat). For those of us who love steaks done the US Steakhouse way (i.e. in 200-300 g steak cuts), a high grade Wahyu beef can be too rich to be enjoyed this way. If like me, you find Wahyu cuts too expensive, I will recommend you use Short Rib Beef if you have a Sous Vide appliance. The beef you want to use for this beef with rice recipe are those which are tender and flavourful. Sous-Vided Short-rib Beef is perfect for this. With great flavors and texture, I find short rib good value for money compared to Wahyu cuts. In fact, sometimes they taste even better than an average Wagyu cut. They range from $2 - $6, with the higher range more well-marbled and flavours. But even a grass-fed short-rib, after Sous Vide for 36 hours, will taste great. Do note that as per serving, you are using 70-100g of beef ( a lot less than eating it as a steak), it may be within your budget to enjoy a meal of good beef. Buy the boneless short rib slabs and have the butcher (i.e MMMFresh or Hubers) vacuum-pack it for you. Then drop it into your SV water bath and slow-cook it for 36 hours at 55C. Then open the packs and you can either throw away the juice or use it to make beef sauce. (To make beef sauce, boil the juice and strain away the solids. The strained liquid will make a good beef stock or sauce.) Slice the slabs into lengths. Then leave them exposed at the top shelf of your fridge to dry the meat overnight (this step is optional). Grill the beef in a pan, about half a minute on each side. After a minute for it to "rest", slice the beef diagonally into thin slices. Sprinkle some salt. Then spread them out on top of a bowl of steaming rice, add some teriyaki sauce and generous amount of chopped spring onions. I can assure you that you will enjoy this bowl of rice, something which you may have to pay a few times more in a Japanese restaurant if you want your Gyudon to come with good beef. And instead of a few miserly pieces, you can have more to go with your meal. As for the Teriyaki Sauce, it comprises Japanese Soy Sauce (Soyu), Mirin (Sweet wine sauce) and Sake. As I have all three, I normally make my own Teriyaki Sauce as it tastes a lot better. I use drinking sake, and at about $10 per 250ml bottle, I find it just slightly more expensive than cooking ones but the taste is a lot better. In a small pot, add equal amounts of Mirin and Soy sauce and half amount of Sake, i.e. 1:1:1/2. Heat up the pot to boil off some of the sake. Add some corn starch if you prefer the sauce to be thicker. You can also use the microwave to make this sauce. You can make this sauce beforehand and keep it in the fridge. When you grill your beef, you can add the leftover oils to the sauce to improve the flavour. If you have made your beef stock from the leftover juice, you can also add that too. Serve the beef and rice with some of this sauce. Don't drench your rice with the sauce so that some of the rice can also be partially enjoyed on its own. A twist or two of freshly ground black pepper will suffice. With good beef, you do not want to mask the flavor with too much pepper. There are of course various ways to serve this and I am sure you can figure out yourself how you want to enjoy this. There are variations, i.e. adding some onions, sesame seeds, seaweed, cut or pickled ginger, using different type of sauces etc. As a general rule, accompaniments should not mask but enhance the flavors of a good beef, which is already great by itself. You can use a ready-made Teriyaki sauce if you find mixing it yourself a bother. The SV-ed beef can be kept in the fridge for more than a week. You can easily prepare a few meals with it. This is a simple and affordable "one-bowl" meal, assuming you have Sous Vide equipment. With just a pair of chopsticks in hand, you will enjoy every bite of good tender flavourful beef, diced spring onions and perfectly cooked Japanese rice with some good sauce. You will have a simple but delicious dinner. Yes, that is what our home dinners can be! i love a good bowl of thinly sliced beef with japanese rice, oishi!! i am considering adding a dash of brandy to my teriyaki sauce so it's doubly delicious. Thanks for sharing! I love the look of this but food flavouring suppliers is key when it comes down to new food. Hi. You have a heart of gold to share all your fantatic tips and great instinctive talent. I love your blog because it is genuine and your recipes work. I am also Malaysian who lives in Singapore. Thank you ! !